Delayed by a day! We’re now leaving Sunday morning April 9th on our passage. We are so exhausted from all the work of getting ready. Thankfully we found these epic hats (best $3 spent!) that help us endure the hardships of passage preparation. 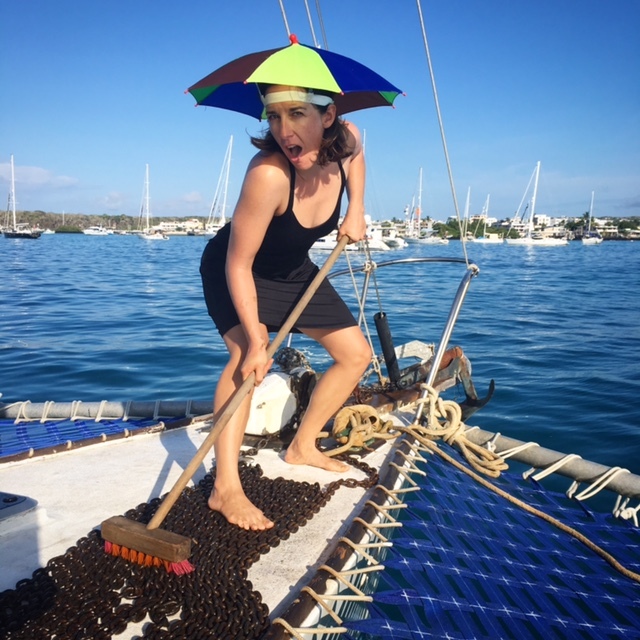 Example of adequate head protection when scrubbing anchor chain in the burning tropical sun. Seriously, I can’t wait to be underway and have less of this compulsion to buy boat parts, food, and send out emails. Spencer wasn’t sure if our rum stash was adequate so he decided to bring a personal addition. just kidding. We’ve done 98% of our provisioning, which includes a huge amount of shelf stable food in our pantry. 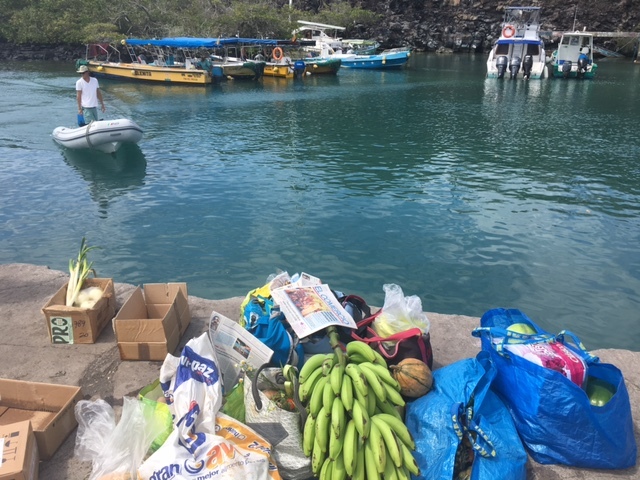 The local supermarket in Puerto Ayora (the town in Santa Cruz island of Galapagos) was quite good and we got 3 shopping carts worth of food. 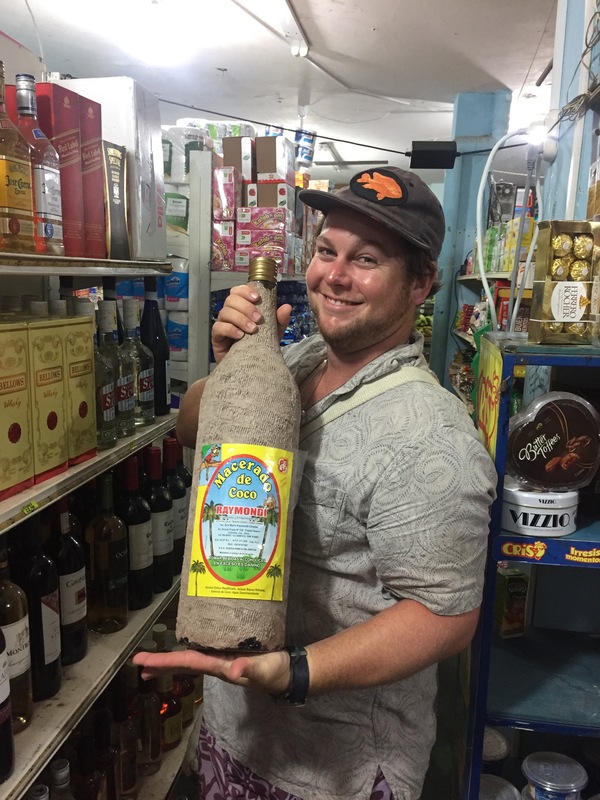 This supplements the 4 shopping carts of food from Bahia Caraquez, Ecuador. 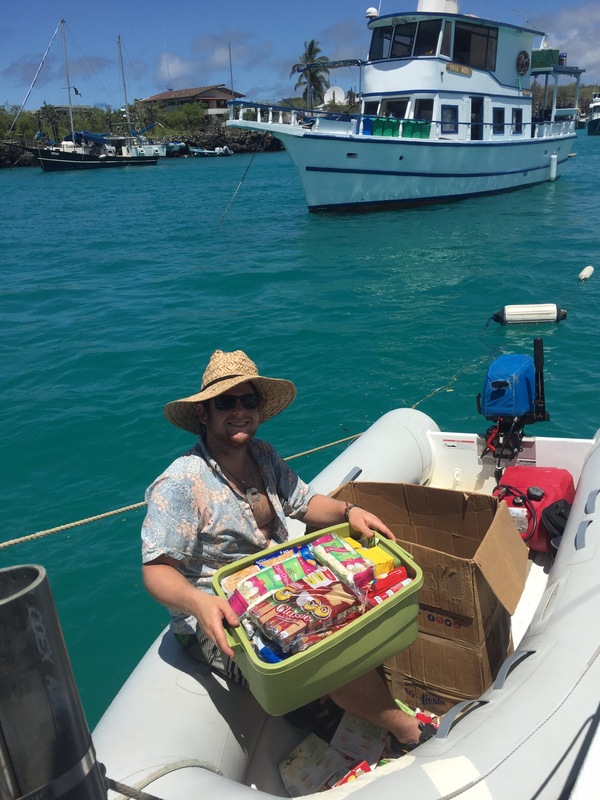 Aboard Aldebaran we’ve got many kilograms of pasta, rice, flour, granola, and everything else you can imagine, all carefully stored in containers in different bins, or vacuum bags to prevent bugs and moisture. Organizing all this is a huge project in itself which Sabrina has been mastering. All that is left… on Saturday morning 6am we’ll buy fresh fruits and veggies at the farmer’s market and then get underway!! 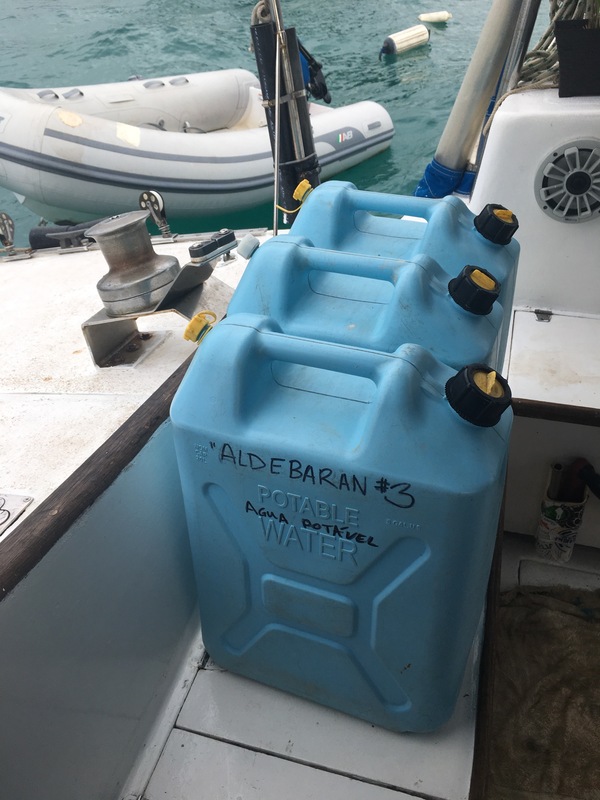 Along the way, we make water for drinking with our small capacity watermaker (1.5gallons per hour, running off our 12volt batteries) but we don’t like to run it inside harbors like Puerto Ayora. Unfortunately there are sooo many ships here running generators that the water smells like diesel. we’re hoping to catch lots of rainwater. A lot easier than carting around heavy jugs of water! Recall there is no dock here in Galapagos to tie up to and fill water. So the main option is to pay a water taxi to bring us water, which costs about $50 for 100 gallons. 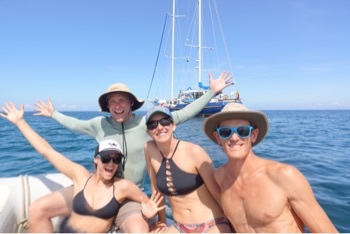 Instead we learned a trick from our buddies Diego and Carolina who live on a sailboat in San Cristobal: going to all the tourist cruise boats asking for water. They have massive watermakers with multiple filters and enough water to pressure wash their decks, so we ask them for 15 gallons at a time. 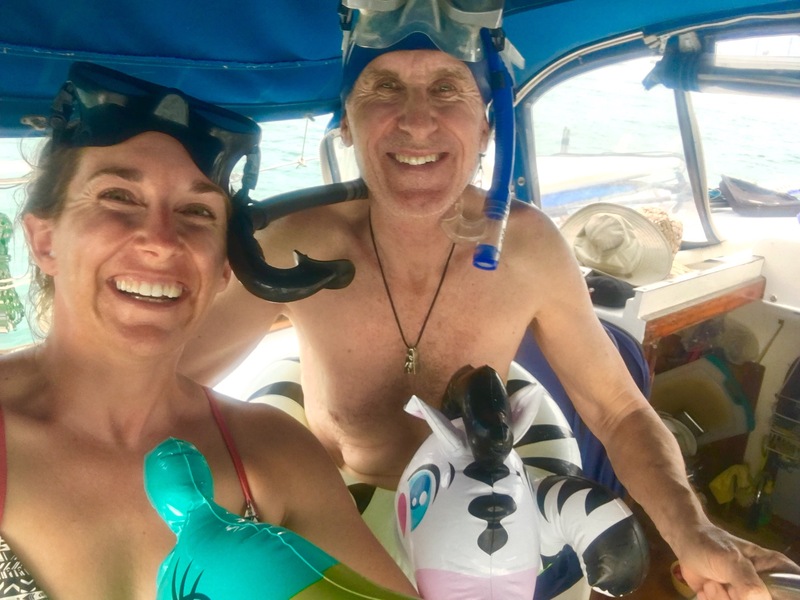 With her sweet smile Sabrina asked all the boats here in the harbor and filled 100 gallons of water to top off our 140 gallon tank. Awesome! 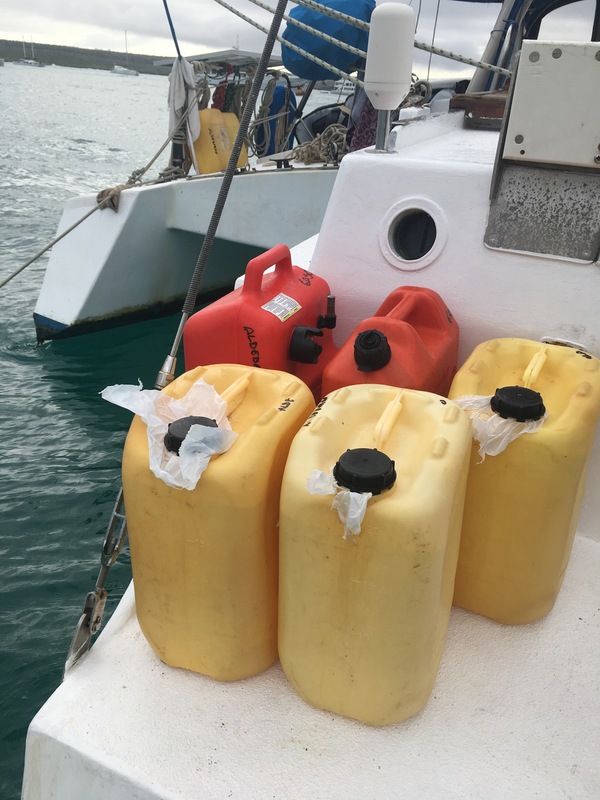 We estimate this will last us about a month for 4 crew member, with just over 1 gallon per day, which is kinda skimpy! The way we pull this off is by using a lot of salt water – to wash dishes, bathe ourselves, even for some limited cooking – and then do a final short rinse with fresh water. We hope to catch some rainwater along the way with our new cockpit roof, and we’ll make a little surplus water whenever we are motoring and using our watermaker… although that is a very slow process. I’m not sure how long our 135 gallons of diesel will last, theoretically it can move us about 900 nautical miles. Our total distance to Gambier is close to 3000 nautical miles! 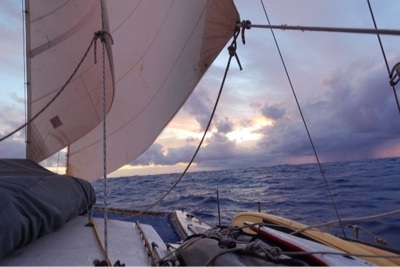 Thankfully we are crossing the SE trade wind belt which is one of the most consistent breeze areas in the world, so we expect to arrive with plenty of diesel, in fact enough to get us to Marquesas (another 900 miles). The last “flammable” item is propane for cooking, which we have 2 big bottles worth (16lbs each). This is a tricky one as the propane fill in French Polynesia has unusual fittings, and it might be awhile before we’re able to fill those back up. Yet, those two large bottles should last us a little more than two months. The faint line shows our proposed route from Galapagos to Pitcairn and onwards to French Polynesia. This is the software “Open CPN” which enables us to look at our route with overlays of wind, historical weather, and much more. Note the tropical low pressure just south of Tahiti is affecting the trade winds in the region of the “Austral Islands” such as Rapa. 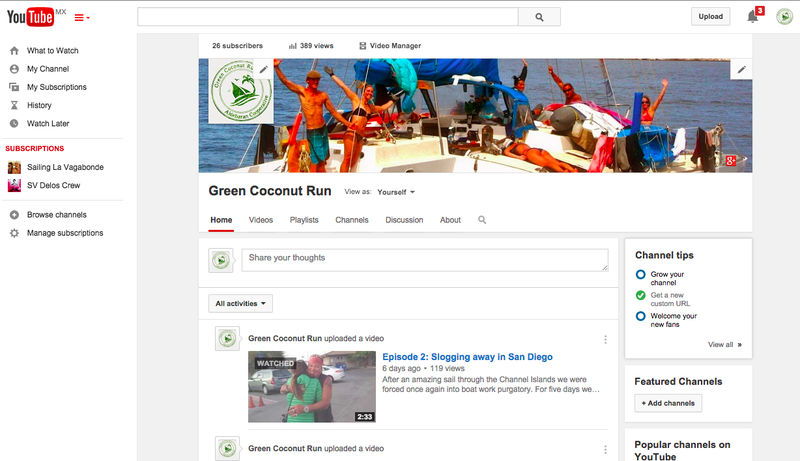 Talking about uniqueness of community… what Floreanna is to the Galapagos, Pitcairn is to the South Pacific. Is there another island in the world colonized by mutineers? So we are very keen to sail there, especially because it’s on the way to Gambier Islands, which look fabulous themselves. 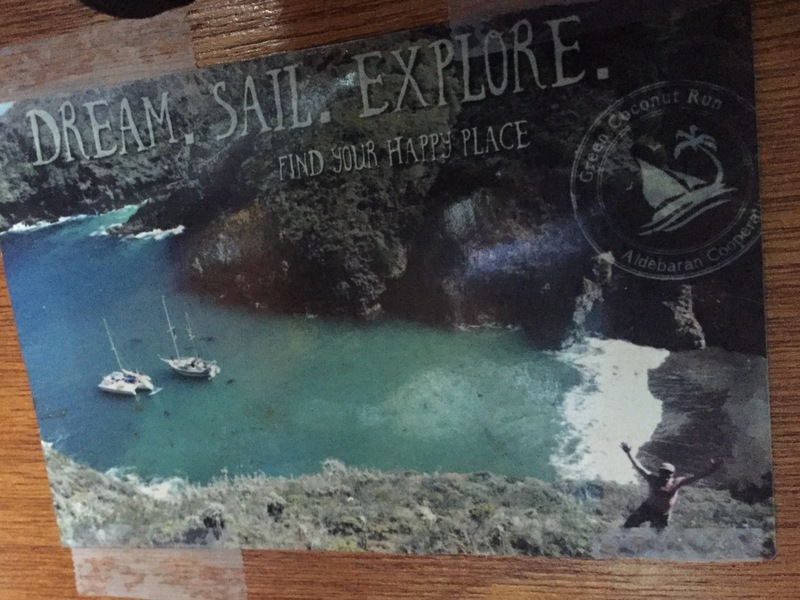 Only about 25 sailboats visit Pitcairn every year, a low number because of its isolation. 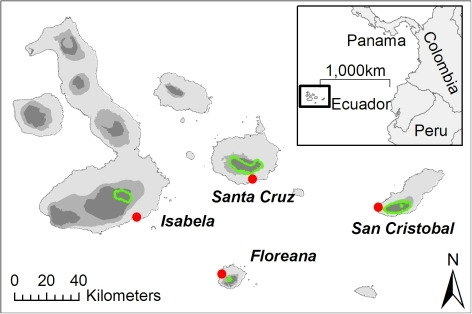 Most sailors leaving from Galapagos head toward Marquesas. 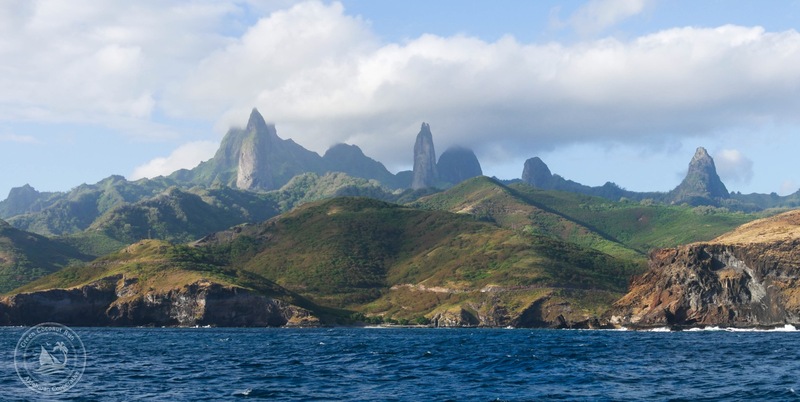 At latitude 10 degrees South, Marquesas is a remarkable downwind sail for almost 3000 miles along the trade wind belt. 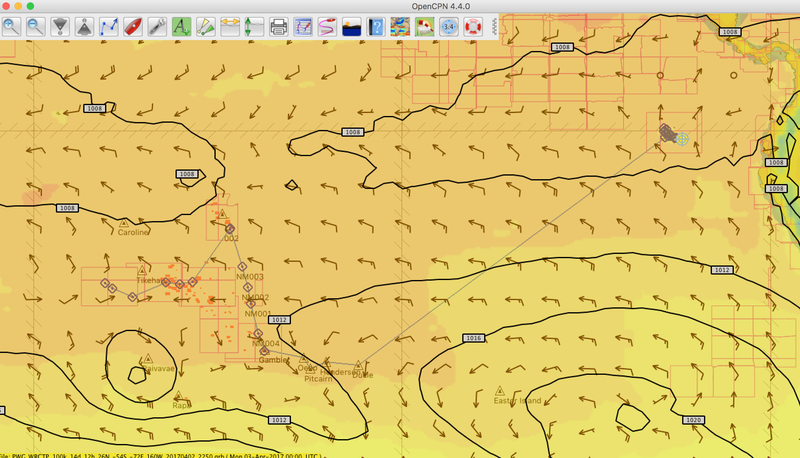 Meanwhile, Pitcairn, is at the low edge of the SE trade wind belt, like Easter Island, which is 1000 miles to the east. 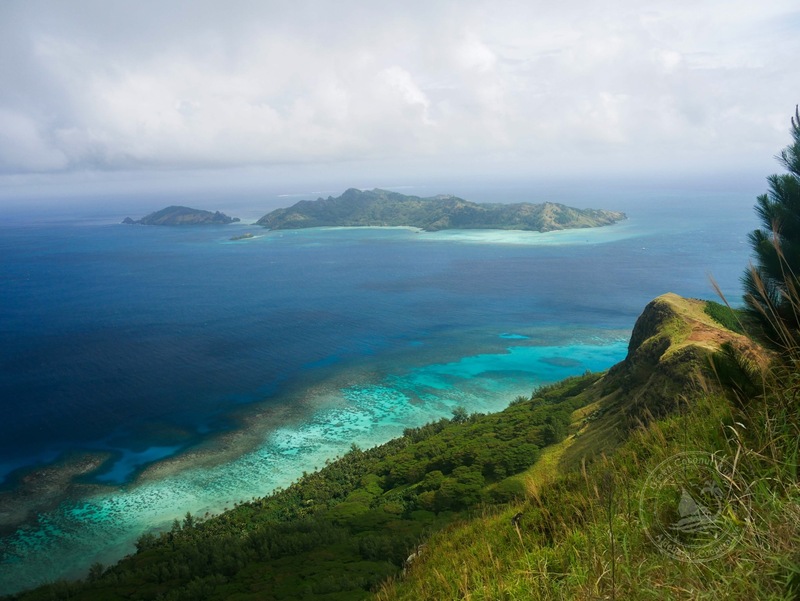 Its closest neighbor is Gambier islands of French Polynesia, 300 miles to the west. 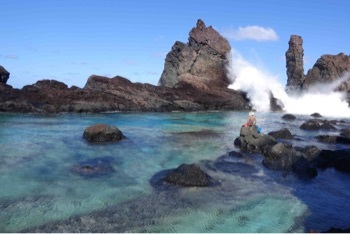 At 24 degrees south, Pitcairn is subtropical and its weather can be more fickle- it is influenced by low pressure systems in the southern ocean, particularly in June-Sep (their winter). This wind map shows the trade wind belt nicely, which is sandwiched by Galapagos (green circle) and Pitcairn (red circle). The trade wind belt moves north June-Oct. This software is Predict Wind, which communicates with our satellite phone (Iridium Go) to download weather updates wherever we are. Instead of going straight downwind, we expect a broad or even beam reach to get to Pitcairn. 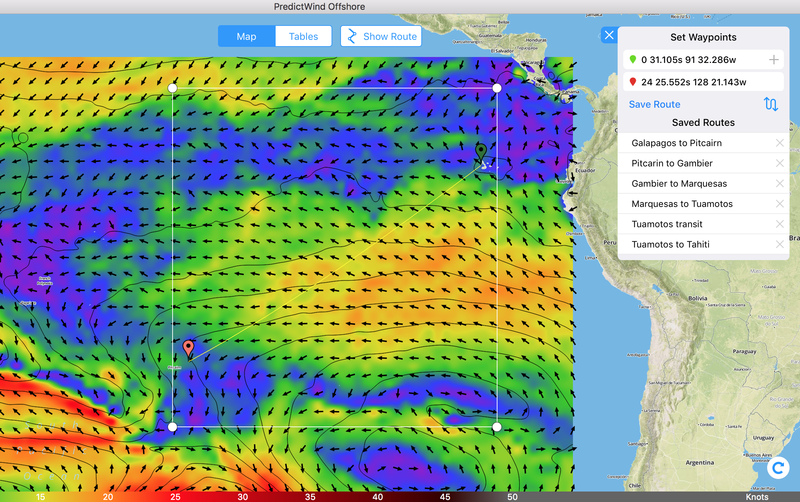 If we get unlucky, there’s even potential for close hauling (into the wind) during the last portion of the trip, as low pressures cause the winds to clock around. As we get to that point (3/4 of the way there) we’ll need to decide how best to weave our way there. The Southern Hemi summertime (Dec-Mar) would be more straightforward to sail to Pitcairn as the SE trades are more fully in place. As winter approaches the trade winds move north and the islands become situated in an area of wind variability. This is the main reason we are deciding not to head to Easter Island – it is a little too late in the season, and we don’t want to get “stuck” there. 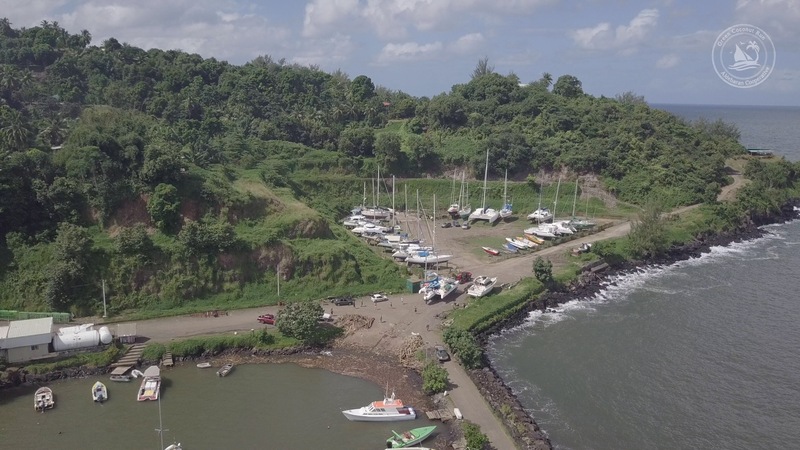 Unfortunately, Pitcairn’s only landing area is exposed to the predominant SE trade wind, and also the south swell, which makes it quite rough. This is none other than Bounty Bay, where the infamous ship Bounty was burned and sunk by the mutineers in 1790 to hide their traces. No wonder Pitcairn was a good site for the mutineers. Nobody ever wanted to land there, the charts placed it in the wrong spot, so they could stay undetected! From what we heard several yachts try to stop at Pitcairn but keep sailing by because the anchoring conditions are too rough. So that’ll also be a test for us once we arrive. Total distance from Galapagos to Pitcairn (via Dulcie atoll, in the Pitcairn group, add one or two days for a visit): 2800 nautical miles. 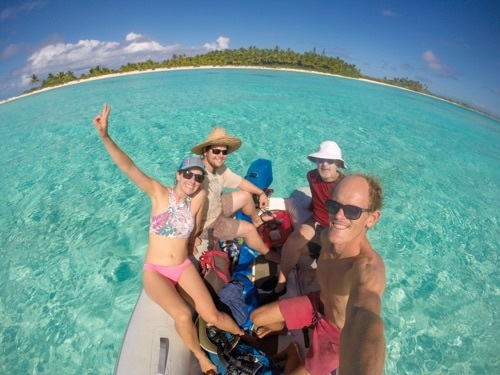 Add one or two days at Dulcie atoll. Dozens of sea turtles go by the boat every morning – it must be their morning commute! They cruise around the rocks surrounding Black Sand Beach, which is the main anchorage in Floreanna’s town, called Puerto Velasco Ibarra. I imagine this black sand is silty, because the visibility underwater is not as good as other islands. 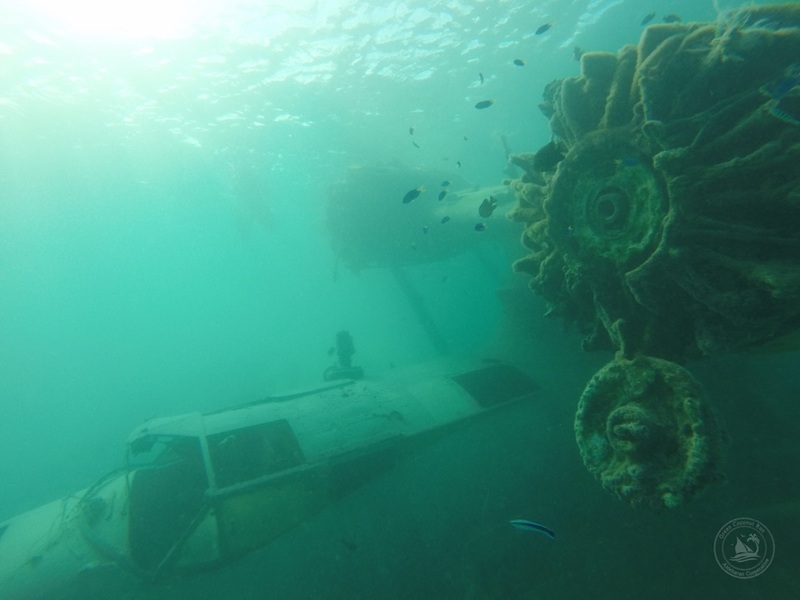 Perhaps because this isn’t a great site for snorkeling, things are more relaxed around here. Probably also because it’s a tiny town of 150 inhabitants with less tourist pressure; hence the capitania said it was fine for us to head to offshore rocks with our dinghy to go snorkeling. This is very unlike the other inhabited islands of Galapagos, where they only want you to go between your boat and the dock. In this way, Floreanna felt a lot more free than the rest of the archipelago. 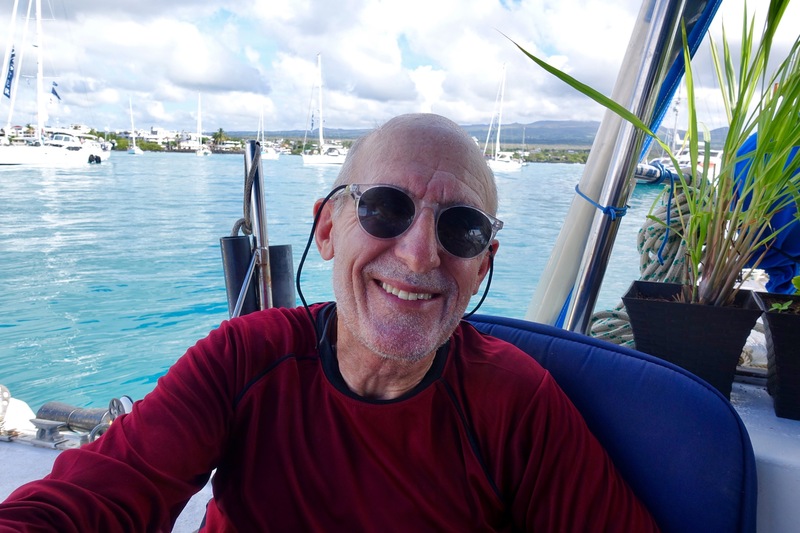 We were happy as clams, heading a mile south of the anchorage to “Roca Botella” – as it looks like a bottle in the water. 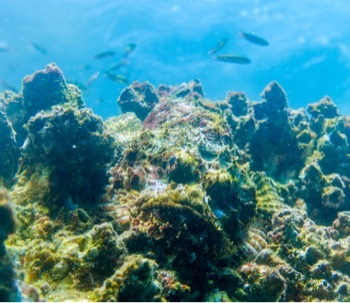 The viz was quite decent at 35 ft, there were tons of fish, beautiful formations in shallow and deep water, and some big parrot fish– although the surge was strong. The Aldebaran crew was stoked to be exploring!! Photos: Check out this camouflaged “scorpion fish”, which Anna found. He didn’t move at all! I woke at 5:40am after sleeping in the cockpit (to ward off the persistent sea lions from our dinghy…) Running lights from a sailboat appeared in the distance. It was none other than “The Beagle”, a replica of Darwin’s ship! The Beagle is a cruise tourist boat. 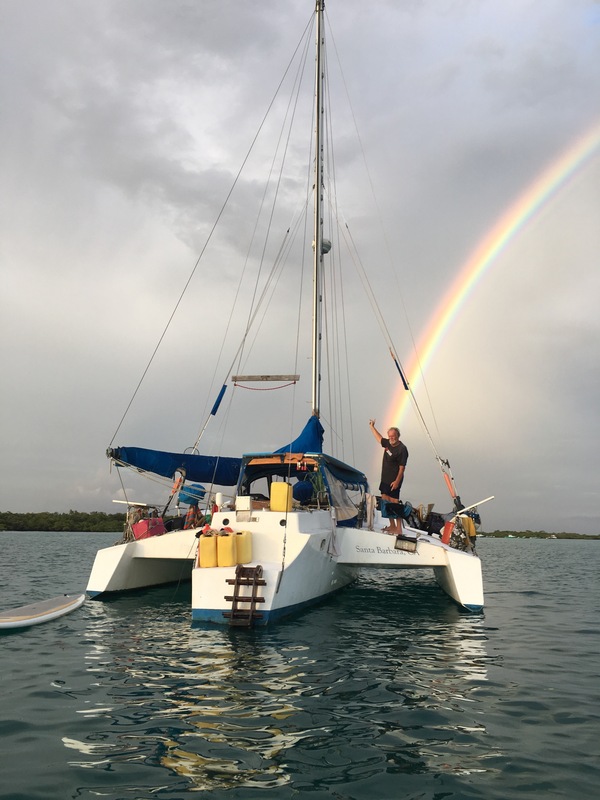 Private sailboat visits to Floreanna are now quite rare, dropped off to just one every other month – mainly because the Galapagos National Park strong arms the agents (who do all the boat permitting). They discourage visits to this island because they lack regulatory officials here to keep an eye on things. But all sailboats with an ‘autografo’ permit are technically allowed to visit “on the way” to another inhabited island. Fortunately we became friends with Jorge from Capitania in Isabela, who gave us this info. Today I’m celebrating my 36th birthday and feeling super lucky for all this! Last night we were taught how to make delicious Yucca cheese patties called “mochin” by Angel and his wife Cecilia, who have been on the island 25yrs. People here are genuine and friendly unlike anywhere we’ve been. I feel blessed to be spending this week in such good company! Photo: Sabby & I with friends Jesse and Anna, and “The Beagle” in background. Crewmate Spence taking the pic! 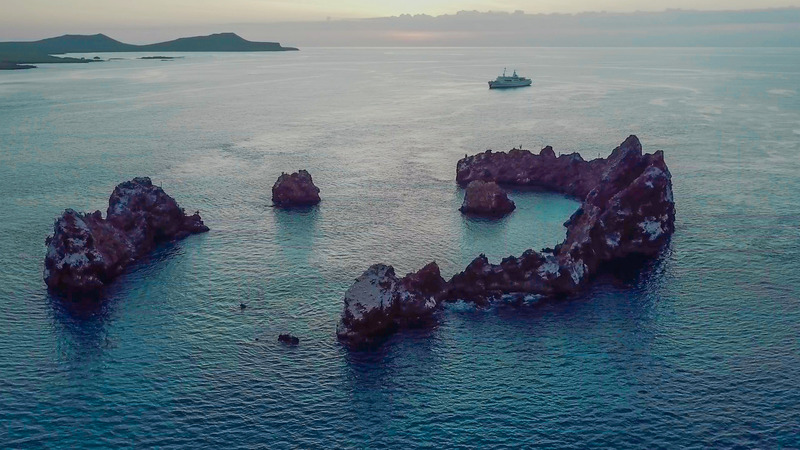 We are anchored in the island of Floreanna, a place that breaks many rules… Although, the Galapagos is known for its flora & fauna, this island is most famous for its unusual inhabitants. 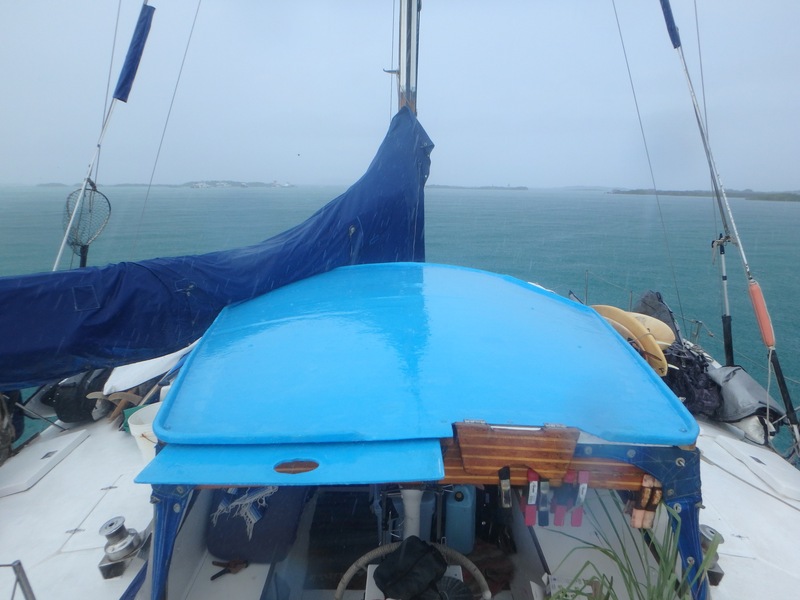 Another quirk: we weren’t really supposed to sail here… more on that later! The story of the “murder of the Baroness” made Floreanna famous. It was set in the era of “back to nature” German pioneers circa 1930. 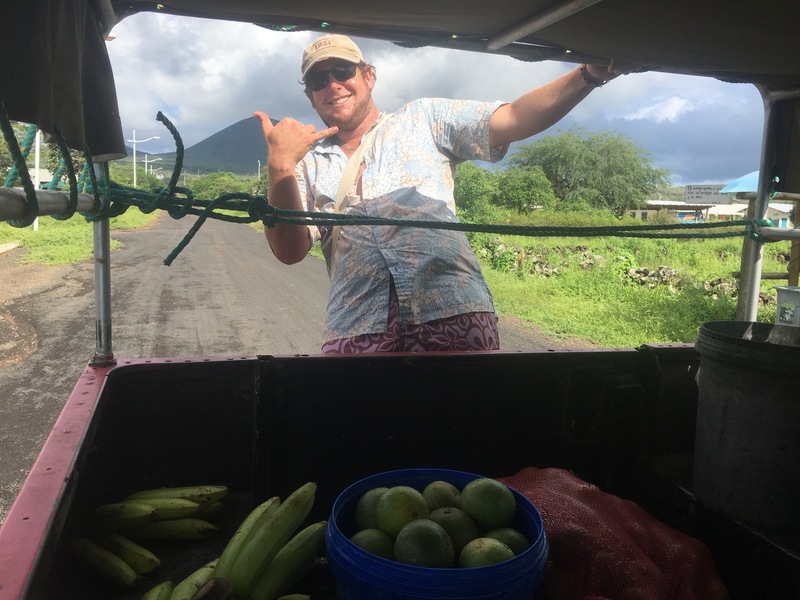 Their crazy personalities became the focus, but it was truly the accomplishments of the ‘more-sane’ pioneers, living on this island with total self-sufficiency, that has blown us away. 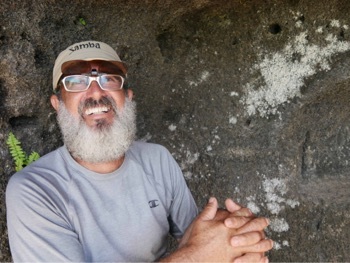 We toured the highlands with Claudio (see photo), son of an original Ecuadorian settler in 1939 of the Cruz family. Naturally visiting the “Pirate Caves” was incredible, but it was Claudio’s stories that seemed out of a storybook. Making candles from cowfat. Making pesticides out of tobacco and chilli pepper infusion. The list goes on. His ranch was mindblowing. Frigates did acrobatics to dip their heads in his lake-reservoir. An abundant overflow of crops and livestock was everywhere. Each tree had a story of when it was planted. This is actually our first blog post via satellite, with 1 low resolution photo, and this much text allowed! Hope it works, and we’ll share more tomorrow. 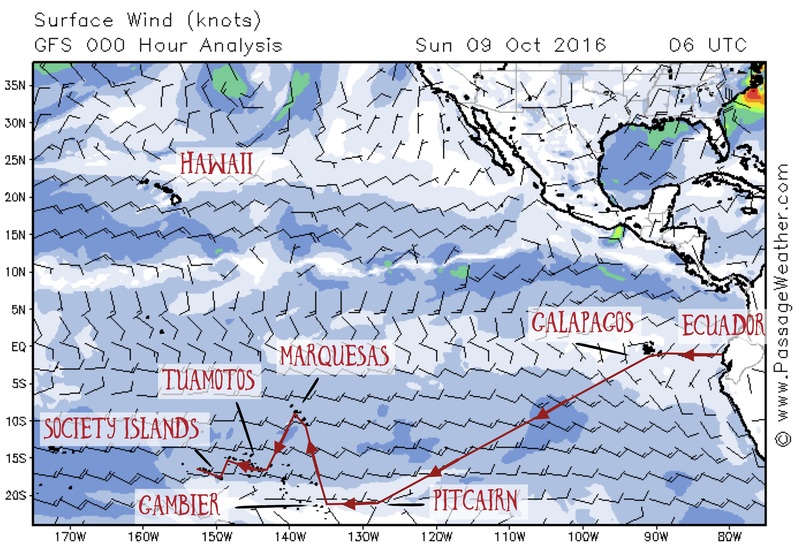 Approximate wind pattern expected across the Pacific… we’ll be sailing south into the trade wind belt (E-SE winds) and crossing into the latitudes of Pitcairn and Gambier, where the winds are more variable, before heading back north towards Marquesas.Only 10 days to departure on our biggest passage ever, across the Pacific Ocean, almost 2700 miles! Follow us on our Blog by subscribing on this link. “Want to go camping in Puerto Chino with us? asked Alexandra. That’s what started our friendship with a bunch of great people in San Cristobal Island. 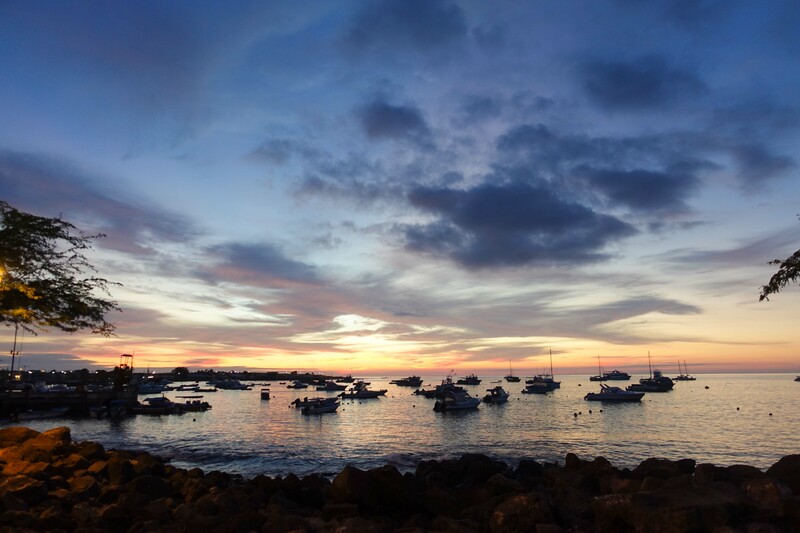 The Galapagos was made famous by Charles Darwin for their animal life. But, they have some of the most wonderful people we’ve met in our travels, and it is more accessible than we ever thought. 100 miles east of Galapagos we spotted whale spouts. We steered towards them, but I was also apprehensive because of the history in this area: there’s a lot of stories of whales damaging yachts around here. Coincidence or not..? We were about to have an intense encounter with the cetaceans. 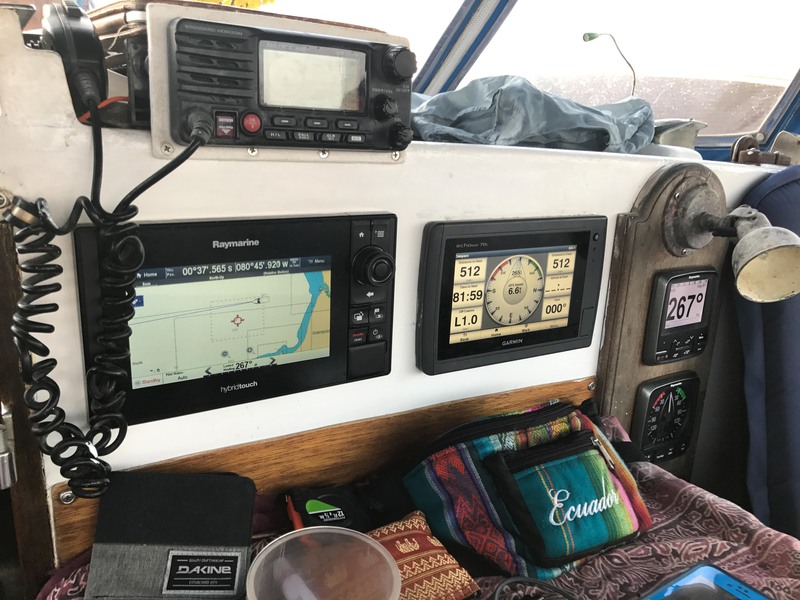 Our 4 day passage from mainland Ecuador to Galapagos was ultra mellow — in contrast with our passage last year from Costa Rica! Read below about our 3 crossings to and from the Enchanted Isles (our latest in February; last year’s in June and September).